Tel-Tru Manufacturing Company - Since 1916, Tel-Tru's goal has been total customer satisfaction through world-class manufacturing, service and support. Tel-Tru's world-class philosophy encompasses state-of-the-art equipment and manufacturing processes and a customer-centric staff and culture. From our beginnings, making household thermometers, up to their latest products serving the industrial, commercial, OEM, HVAC, and food service markets, they have always put the customer first. A World-Class Manufacturer of Bimetal Thermometers, Pressure Gauges and Accessory Products. 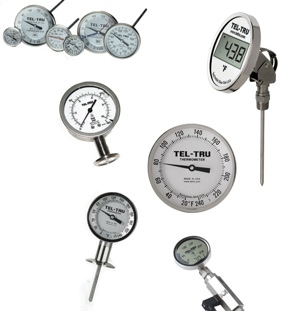 Liquid Filled & Dry Pressure Gauges, Industrial Thermometers, Bi- Metal Thermometers, Diaphragm Seals, Remote Reading Thermometers, Pressure Switches, Industrial Thermowells, Complete service for Gauges and Thermometers including Recalibration and Liquid Filling.